Scandinavian design is defined by simplicity, lots of open spaces, less furniture pieces, more white as background, pastel accents, plants, wood and simple geometry of lines. 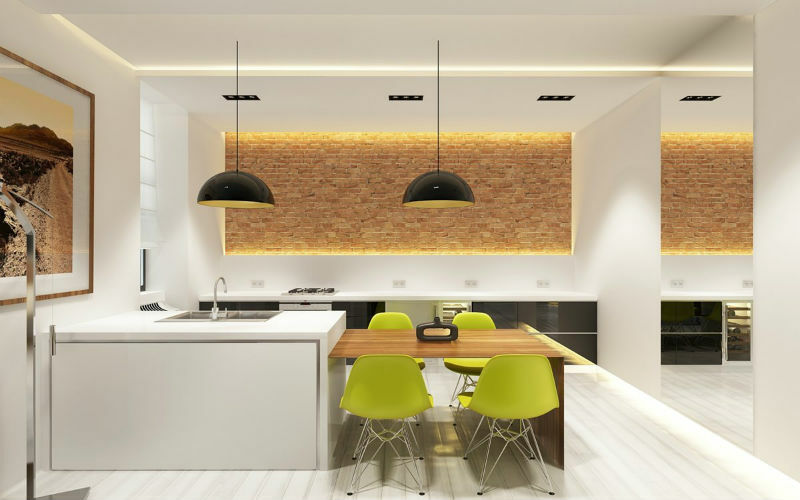 This approach for interior design fits the larger domain of minimalism, in which the most popular are natural stones with “full” colors and less textures. At the same time, the play of pastel colors – contrasting with the background – is beautifully performed by colored stone or veined stones. 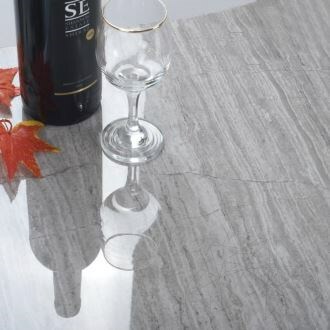 So, among the natural stones that use this design we find many types of marble: Thassos, Calacatta Lucina, Sunny Dream, Tundra Grey, White Wood or Athena Grey, Nero Riven Slate, Padang Dark Granite or Classic Cross Cut Travertine, but also panels such as Pure White Marble Cladding Panel. As you can see, there are many natural stone tiles having more or less full colors, suitable for Scandinavian interior design, while remaining uncovered products that create contrasts with the dominating white color of the background. 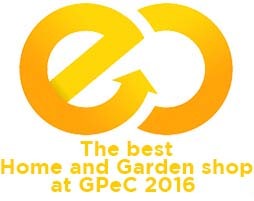 On the list of chromatic contrast we can find traditional decorative brick, onyx, slate wall cladding, Catania Cream Marble Wall Cladding Panel, Limestone Sparta and sandstone wall cladding. 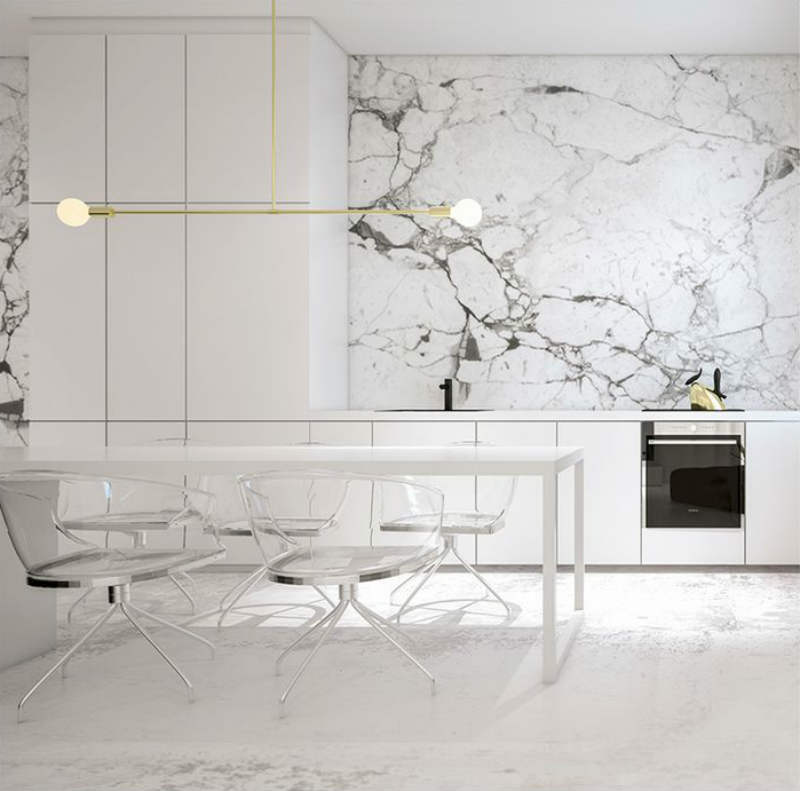 Also in here, we discover an innovative approach, often used: the contrast for a white setting is also established with white marble, but with more visible veins, like in the image below (Photo 1). Wood is a very important element for the aesthetic of Scandinavian minimalism. For this setting (see Photo 2 and 3), if we combine perfectly white color with natural wood, then the traditional decorative brick comes as a perfectly balanced solution. In Photo 2, the brick plays the part of mediator between wood and the green color of chairs and this mediation is accomplished by light. Illuminated in this way, the decorative brick is adorning even more the white space, conveying intensity into the room, with a modern and dynamic look. 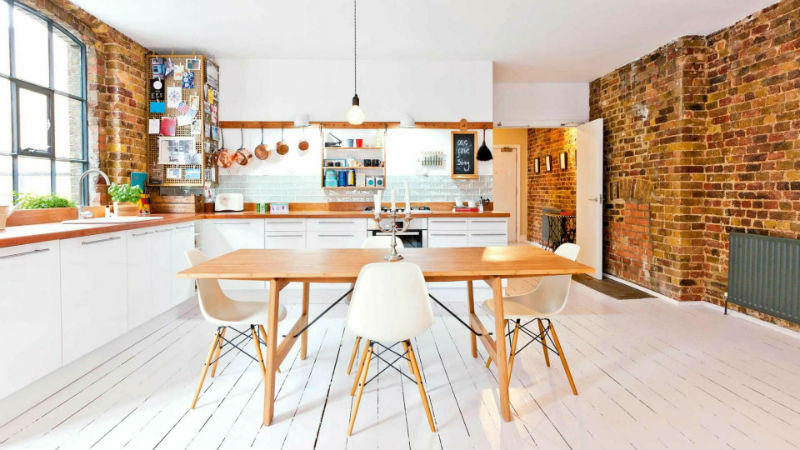 The same type of harmony takes place in Photo 4, with color synchronization between wood and brick, a very good example of Scandinavian minimalism in small spaces. 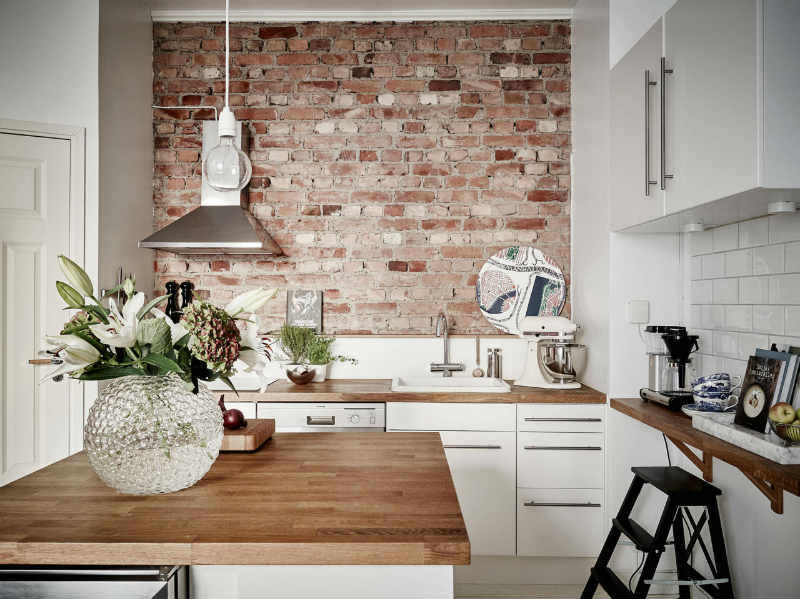 The decoration project of this kitchen uses decorative brick for suspending the dominating white color and thus creating a sensation of an even larger space. In Photo 5, minimalism reaches a maximum that cannot leave you indifferent. In here, we discover one of those style innovations that works only for veined stones: marble with rich veins on the wall is “interrupting” the dominating white, while the color spots in contrast are the 2 yellow arms from the lamps. The discrete grey chairs is “rhyming” with grey veins and the black door of cooking oven will highlight the parallel lines from the furniture (keep in mind that very detail counts!). 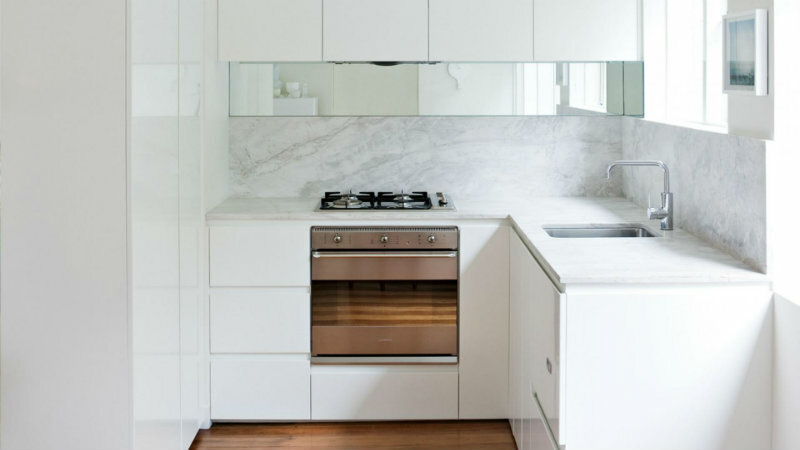 Elegance of marble used as countertop is highlighted in the smaller kitchen from the Photo 6 (see below), in which, once again, the cooking oven is the main point of attraction while making more visible the geometry of space. Photo 7 shows a decoration project based on some fine mix of white shades from the furniture, paint on the right wall and ceiling, in combination with the front wall marble cladding the left wall marble cladding. 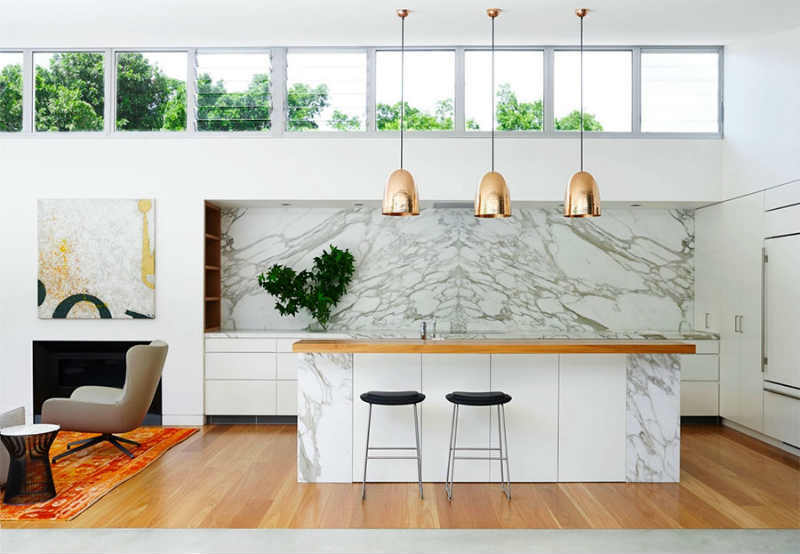 Natural stone is not rejecting massive white as dominating color, specific for Scandinavian design and is perfectly integrating into the setting, while bringing an important touch of style, with minor differences between the 2 walls. In this way, color spots – yellow and black – can play the part of contrasting color variation, with no restrictions. 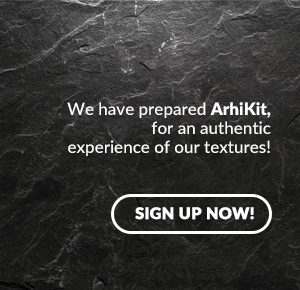 Thanks to the many shapes and colors, natural stone can play an important part in Scandinavian decoration style. And even if minimalist style in interior decoration might seem simple for some people, this is certainly not the case. 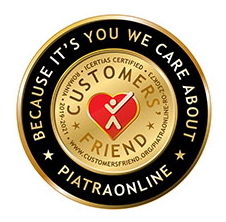 For different combinations of natural stone, regardless of your decoration style, get in touch with us by email: export@piatraonline.com, by phone: +40318.222.333 or better visit our showroom from 137 A, Aleea Teisani, District 1, Bucharest.